Spend a day at Nashville Zoo! 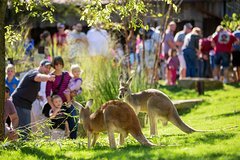 Critter Encounters, Lorikeet Landing, Shell Station, and Kangaroo Kickabout are only a portion of the popular animal exhibits you can see some of your favorite animals. Have hands-on fun, learn something, take a wild ride, and have a great time at Nashville Zoo. Explore Nashville Zoo, located at 3777 Nolensville Pike. Walk through the entrance and enter the animal kingdom. Choose from several attractions to fill your day with wonder and furry creatures. Roam the trails, such as the Savannah Loop. See majestic giraffes, visit Lorikeet Landing to get nose-to-beak with these Australian parrots in the beautiful aviary. On the Zoo Central trail, have an adventure on the Jungle Gym, a 66,000-square foot playground. Go to Gibbon Island and the Unseen New World to experience incredible animals crawling in trees and gliding through water. Follow the Jungle Loop for the Flamingo Lagoon and Critter Encounters. Visit Kangaroo Kickabout and the Shell Station for wild times! Check out the daily schedule of activities to ensure you do not miss out on amazing events. Witness a River Tank Feeding and attend Keeper Talks on several topics, including the Red River Hog, Cougars, and the Africa Field. Watch animal shows and go on tours to keep the adventure going. Experience all Nashville Zoo has to offer with this one-day admission.